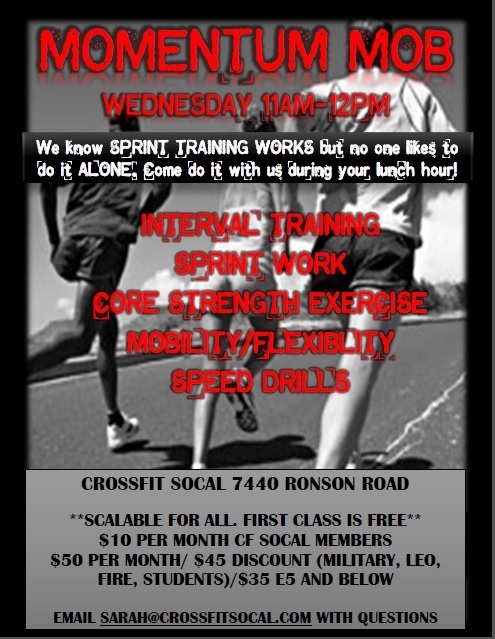 COME OUT TODAY FOR THE MOMENTUM MOB SPEED AND STRENGTH CLASS. HIT IT UP BEFORE THE NOON CLASS OR ON A LUNCH BREAK! WE KNOW SPRINT TRAINING WORKS BUT NO ONE LIKES TO DO IT ALONE. OLY: Squat clean (1x floor) – 5 sets x 1 rep x every 90 seconds. Work up to a max for the day.